Until 1827, Isycoed was a sub-chapelry of Holt, which was itself a chapelry of Gresford. In 1827, Isycoed became a separate parish, with an area of 3530 acres, comprising the Denbighshire townships of Cacca Dutton, Dutton Diffaeth, Dutton y Bran, Ridley, and Sutton. Although the parish of Gresford was (and is) in the diocese of St. Asaph, Isycoed was in the diocese of Chester until 1849, when it was transferred to St. Asaph. There was a church recorded on the site in 1718. 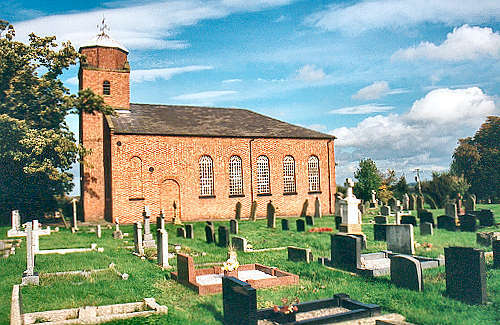 This was replaced in 1742; and the present church was built in 1829. For family history information about the church and parish, visit the GenUKI Isycoed page.